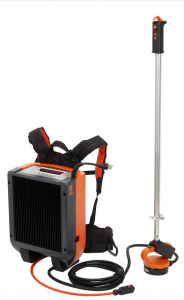 SFS Group USA, Inc. (SFS) launches the new isoweld Backpack, a portable and versatile induction welder for installing single ply membrane. Providing the same functions as the isoweld 3000 stand-up tool — the Backpack system offers greater speed and agility. The isoweld Backpack system includes a power generator that is interchangeable with the isoweld 3000 stand-up tool frame, replaceable closed cell foam shoulder straps with integral waist strap, and the original low profile hand-held inductor for detail work which converts to stand-up mode for ultimate productivity. Also standard with the system is a 3-button corded activation switch as well as an adjustable handle with wireless activation switch, offering the user their preferred method of activating the weld function. For more information, visit www.sfs.biz.